Reports say the alleged gunman at Fort Hood is Maj. Nidal Malik Hasan. It's not known if he is Muslim. 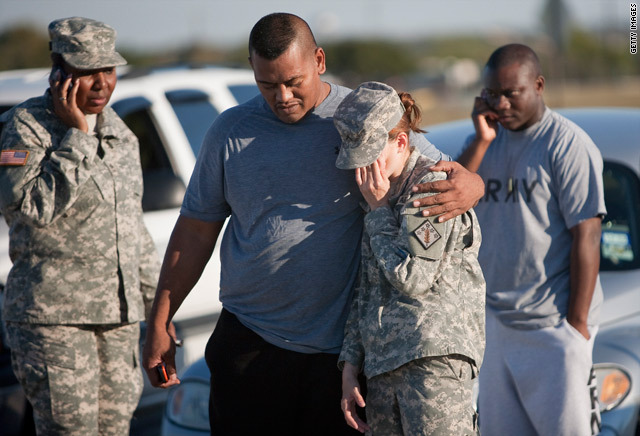 A CNN Special Investigation drills down on the causes and the impact of the Fort Hood shootings, at 8 p.m. ET Saturday on CNN TV. Washington (CNN) -- Ibrahim Hooper knows the drill. When news first broke Thursday that a shooting at Fort Hood, Texas, killed and injured U.S. soldiers, the national communications director for the Council on American-Islamic Relations wrote a statement of condemnation. He only sent it out later, when reports emerged that the alleged shooter's name was Maj. Nidal Malik Hasan. "As soon as we saw what appeared to be a Muslim name, we issued our statement," Hooper said. "Until that time, we were praying that no Muslim would be involved." That's the reality of crisis management for the Muslim-American community, said Hooper, who handles communications for the nation's largest Muslim civil rights and advocacy group. 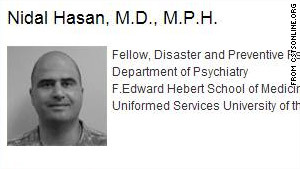 Even without confirmation that the alleged gunman was Muslim -- there was no immediate determination of any religious affiliation for Hasan -- the mere reporting of a possible Muslim name required an immediate comment, he said. "That's unfortunately the world we live in nowadays," Hooper said. "So often, Muslims are accused of not condemning these kind of acts." The CAIR statement said: "No political or religious ideology could ever justify or excuse such wanton and indiscriminate violence. The attack was particularly heinous in that it targeted the all-volunteer Army that protects our nation. American Muslims stand with our fellow citizens in offering both prayers for the victims and sincere condolences to the families of those killed or injured." In a separate statement, the Muslim Public Affairs Council, based in Los Angeles, California, condemned what it called the "heinous incident." "We are in contact with law enforcement and U.S. federal government officials to gain more facts from this tragic incident and work together in dealing with its aftermath," the group said. Its statement called on "all members of American Muslim communities to be in contact with local law enforcement for the safety and security of their communities and their institutions." The Islamic Information Center also issued a statement "in conjunction with all the major Muslim organizations nationwide" that condemned the attack. "While several news reports have cited one of the gunmen to be Army Maj. Nidal Malik Hasan, IIC strongly emphasizes that this attack and its perpetrator are in no way representative of the Muslim people or the peace-loving religion of Islam," the statement said. "The individuals who perpetrated this attack blatantly acted against the teachings of Islam and humanity," it added. After the September 11, 2001, terrorist attacks on the United States, Muslim-Americans reported increased attacks and threats by revenge-minded non-Muslims. "We've seen this before," Hooper said of a possible backlash. "Whenever there's an incident of this type, there's always the possibility this will happen." Even non-Muslims could be targeted, he said, noting that Sikhs who wear turbans or Hispanic-Americans can be mistaken as being of Middle Eastern descent. On Thursday night, CAIR Executive Director Nihad Awad told a news conference the alleged Fort Hood attacker's motive remained unknown. "We urge all Americans to remain calm in reaction to this tragic event and to demonstrate once again what is best about America -- our nation's ability to remain unified even in times of crisis," Awad said. "We urge national political and religious leaders and media professionals to set a tone of calm and unity. "Unfortunately, based on past experience, we also urge American Muslims, and those who may be perceived to be Muslim, to take appropriate precautions to protect themselves, their families and their religious institutions from possible backlash." A key congressional panel opened its probe into the Fort Hood shootings with a pledge to find out if authorities could have prevented the attack. Military victims of the Fort Hood massacre could receive the Purple Heart if Congress passes a bill introduced by a Texas representative. Maj. Nidal Hasan has been charged with 13 preliminary counts of premeditated murder stemming from the Fort Hood shootings, the Army said. President Obama led a memorial service for the 13 people killed in the massacre at the largest military installation in the U.S. The Fort Hood suspect urged in 2007 that Muslims in the Army be allowed to claim "conscientious objector" status, an official said. Pvt. Joseph Foster was filling out routine paperwork when he heard a shout quickly followed by a burst of gunfire from just a few feet away. Investigators believe the Fort Hood suspect acted alone, but U.S. intelligence agencies flagged his communications in 2008, the FBI said. Members of Michael Cahill's family said they know had he not been killed, he would have been trying to save the lives of the wounded.